The Sri Lankan High Court has sentenced former army commander Sarath Fonseka to three years in prison after finding him guilty of making false allegations against the president’s brother. He was found guilty on Friday of “spreading disaffection” over comments in a newspaper that Gotabhaya Rajapaksa, the country’s defence secretary, had ordered the killing of Tamil Tiger leaders as they tried to surrender in May, 2009. 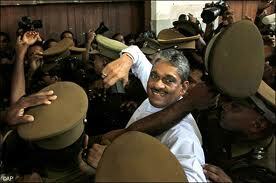 Fonseka says he was quoted out of context in the Sunday Leader article published on December 13 of that year. He is currently serving a 30-month term after a court martial found him guilty of corruption in military procurements. Al Jazeera’s Minelle Fernandez reports from Colombo. There has been a massive rally in Hamburg to commemorate a string of immigrant murders blamed on neo-Nazis. Members of the city’s Turkish, Greek and Jewish communities joined the silent march. It follows revelations that three neo-Nazis had been killing immigrant shopkeepers for years and police have failed to connect the murders to right-wing extremists. Saif al Islam Gaddafi has told his captors he does not recognise the International criminal court in the Hague. Human rights groups have called for Muammar Gaddafi’s son to be handed over to the ICC. But Libya’s interim Prime Minister said Saif Gaddafi will get a fair trial at home. The new Libya is considering how it will live by Islamic Sharia law, which includes some traditional practices which some countries consider inhumane. Many Westerners were among those horrified when this vision was voiced just days ago amid celebrations over the death of Colonel Gaddafi. Liberal West seems certainly at a loss to understand the impact and ramifications. Lets listen to this talkinghead. 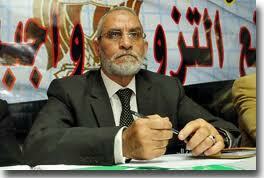 More democracy is bringing more political Islam in the countries of the Arab Spring. The strong showing of Tunisia’s moderate Islamists in Sunday’s election and a promise by Libyan National Transitional Council leader Mustafa Abdel Jalil to uphold Sharia have highlighted the bigger role Islamists will play after the fall of the autocrats who opposed them. The man claiming unprecedented political legitimacy in Tunisia’s election is said to embrace humanist Islam, and not any extremist rejection of modern, Western, culture. Now latest Speech shows its another Taqaiyya– calls it Revolution! islamic Revolutiuon that is. Tunisia’s Islamist Ennahda party has been confirmed as the winner of the country’s first free election following its revolution. The election commission said the party had won 90 seats in the 217-seat assembly. Outside the Ennahda’s headquarters in the capital Tunis there were celebrations for the political group banned under Ben Ali’s regime. At Egypt Islamist take over of the Uprising has lead anti-Zionist and anti Christian vicious and cyclical violence already. The transition to Pluralist and Open society is naturally viewed with increasing alarm by Secularists there and world at large- as more Islamist groups and Islamist ideas get endorsed and put in lead. Gaddafi killing violates Geneva code on POWs. 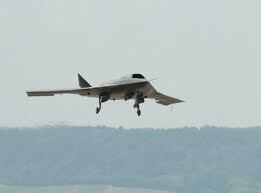 Rebels and NATo bombing record must also be probed- and sensing our demands NATO retreats in panic. Earlier it stated it would remain and monitor ! Monitor they must- but not without accountability to their partisan help with violations. Libya must be helped to clean the slate before hopes of a new era of Liberty. Aronite Thinking was the earliest to help Libyan Uprising. That is when reports were ignored and US turned the other way at crack down of Libyan civilians by Gaddafi loyalists. But the Rebels without a central command or Value systems save hate for Gaddafi regime went berserk- turning into a mirror of Fascist regime. This must be corrected -otherwise the blood of Libyan Youth who rebelled to out throw Tyrrany will go waste. They would end up like Iranian students who helped Ayoltollahs to instal a ruthless Islamist dispensation- and getting crushed under the tyrrany of Sharia pseudo-democracy. We were also the earliest to criricise the outstep of NATO misusing UN mandate to push militarist and economic objectives disregarding Civilian Libyan casualties tagged as pro-Gaddafi-such as the Blacks and Libyan berbers. 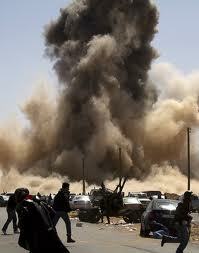 NATo has much to explain its Partisan collsuion with Human Rights violations in Libyan civil war. The maninstream media took partisan sides and colloborated in the cover up of Human Rights violations by Rebels and also blithly stood by the erection of a ‘Sharia’ based regime as the “french Revolution’ ! Internet has now become the impartial voice of humanity and it cherished values and its liberties. The UN has called for an international investigation into the death of Muammar Gaddafi, the deposed Libayn leader, saying it could well have been a war crime. Christof Heyns, the UN Special Rapporteur on extrajudicial, summary or arbitrary executions, told Al Jazeera that a proper investigation into the exact events surrounding Gaddafi’s death was a key test for Libya’s future as a democratic and accountable state. Libya’s turning a new page in its history following the killing of ousted dictator Colonel Moammar Gaddafi. His burial has been delayed after the UN called for an investigation into how he died. 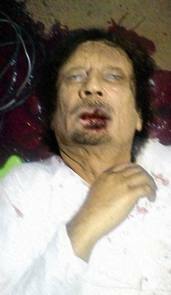 Gaddafi was reportedly shot in a crossfire during an assault on his hometown of Sirte. But the footage of his lifeless and broken body was so graphic, some are wondering why it was broadcast for the public to see. A senior National Transitional Council official has said that deposed Libyan leader Muammar Gaddafi has died of his wounds after being captured near his hometown of Sirte. Muammar Gaddafi came to power in 1969 in a coup at the age of 27 and went on to rule Libya for 42 years with an iron fist. He has left Libya in tatters and despite the vast oil wealth, a vast majority of Libyans still live on about $2 a day and 40 per cent remain unemployed. Gaddafi wanted to be the leader of the Arab world and modeled himself on Egyptian leader Gamal Abdel Nasser. He published the Green Book which established rule of the people but in reality he exercised absolute power. The former Libyan leader was accused of bombing Pan Am Flight 103 in Scotland, a charge he always denied. After this Libya remained under internatinal isolation for years. When the uprising gathered momentum earlier this year he blamed everyone, from US to al-Qaeda, and called the protesters rats and cats of Libya. Many will remember Gaddafi as the leader who set Libya back by many years. Loyalists of toppled Libyan leader Muammar Gaddafi have been holding out in Sirte, the last city to be fully liberated. Sirte benefitted greatly from Libya’s wealth, but the hometown of Gaddafi now symbolises the divide in the country. Heavy shelling and gun battle have ravaged the city. And residents have borne the brunt of the conflict, helplessly witnessing their city having been looted and burned down. The new rulers may win this war but it has to be seen whether they will be able to win the hearts and minds of the people here. Al Jazeera’s Tony Birtley reports from Sirte.